Tết, or Lunar New Year, is the most popular and exciting Vietnamese holiday during the year. A few weeks prior to Tết, Vietnamese shopping centers are flooded with vendors selling beautiful flowers, festive decorations, illegal firecrackers, and distinct Vietnamese specialty food available only during Tết. I hate large crowds, but love shopping during Tet. Trust me, it’s very colorful and exciting! It is also super fun to dress the kids up in traditional Vietnamese clothing and walk around these public places and then visit grandparents, aunts, uncles, and relatives to personally wish them Happy New Year, receive red envelops called li xi with some money inside, and party with friends and family. 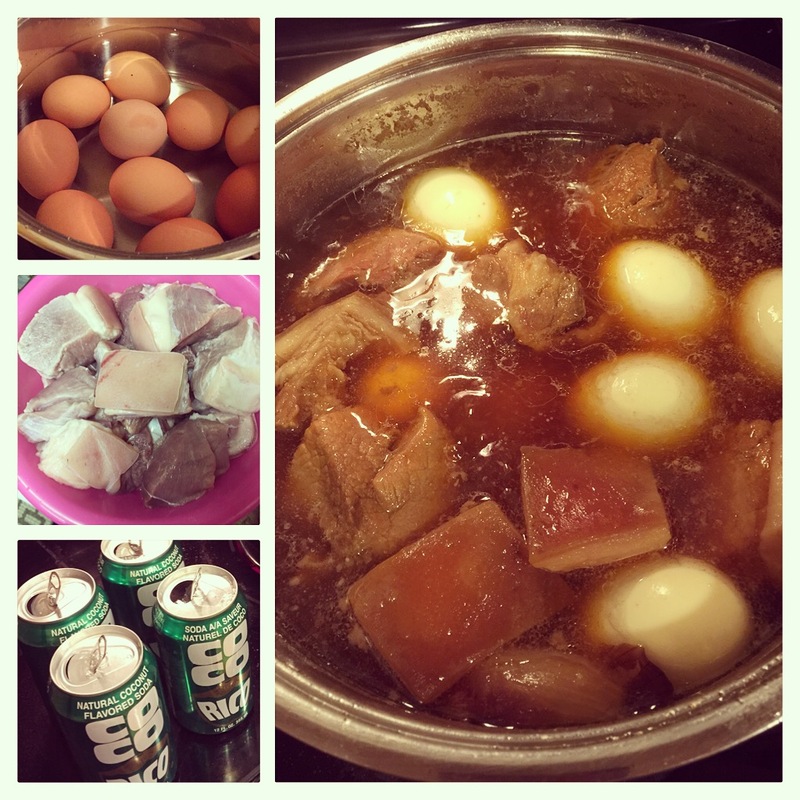 One savory comfort food that you will always find cooking in every Vietnamese household during Tết is Vietnamese Caramelized Braised Pork and Eggs or Thit Kho Trung. 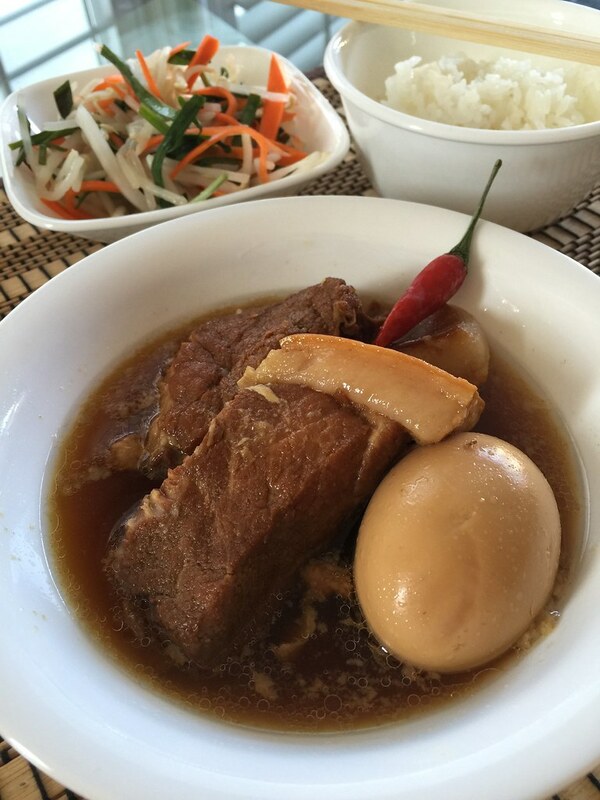 The pork and eggs in this dish are slowly braised in coconut juice and simmer in a large pot for several hours. Overtime, the sauce caramelizes and turns beautiful brown, the collagen in the pork breaks down and the meat becomes super tender, and the irresistible rich fatty skin melts immediately once it enters your mouth. It is a heavenly experience. Thit Kho Trung is typically served with white rice, but I also had some success making Vietnamese sandwiches, spring rolls, burritos, and even tacos. However, my all time favorite way to eat thit kho is to fill up a medium-sized bowl with rice, tender pork, hard-boiled egg, savory liquid, and spicy Sriracha sauce, then smash everything into bite-sized pieces, mix everything together to ensure that I get a little bit of everything in each delicious bite, and finally, I eat! Parboil meat for about 5-10 minutes to remove gunk that floats to the surface. Drain the water, wash the pork, pat dry and place in a clean large pot. Marinate pork in fish sauce, thick soy sauce, garlic, and shallots for at least 2 hours. Turn heat on high and let pork sear for a bit. 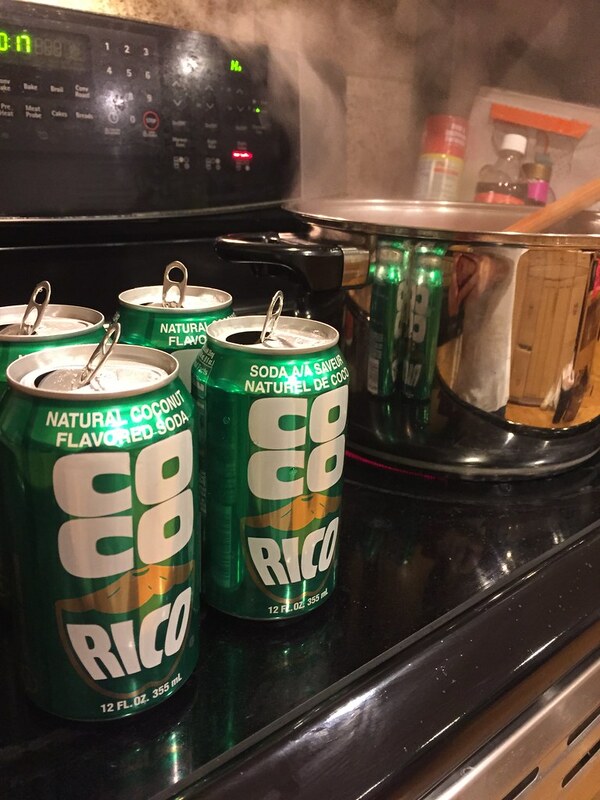 After you get some color on the pork, pour in Coco Rico and water and bring to a boil. Reduce the heat to medium, remove any gunk on the surface, and simmer for at least 2 1/2 hours or until pork is tender. While the pork is simmering, boil the eggs. Once cooled, peel and set aside. Add hard-boiled eggs to the pot halfway during the simmering process. Enjoy with white rice and pickled bean sprouts. Use Thick Soy Sauce to create a bold darker sauce. Molasses is a good substitute. However, it is totally optional.